Somehow, it seems fitting that Easter comes at the same time nature is waking from a deep winter’s sleep. Who doesn’t love yellow Daffodils? Mine aren’t blooming yet, so I snapped a neighbor’s patch! Don’t know what these are either, but one yard was lined with them. One house had an entire row of these blue Hyacinths, and the scent was intoxicating! Who invited Mushrooms to the party?? Note: Happy Easter to all my friends celebrating the holy season! Happy Spring to all! 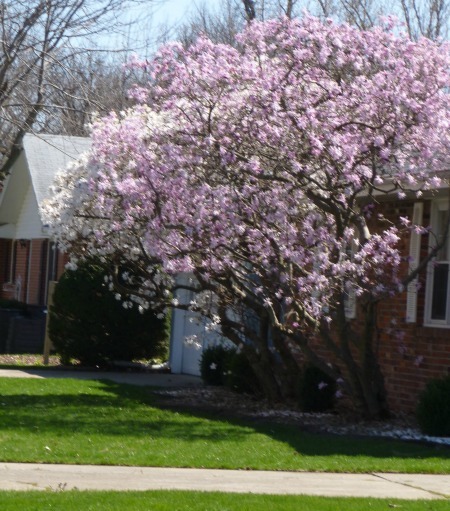 This entry was posted in Seasonal and tagged daffodils, hyacinth, magnolia, spring, weeping cherry. Bookmark the permalink. Happy Easter, Debbie, and thanks for the gorgeous photos. The one you weren’t sure of? The blue one about in the middle of the series. 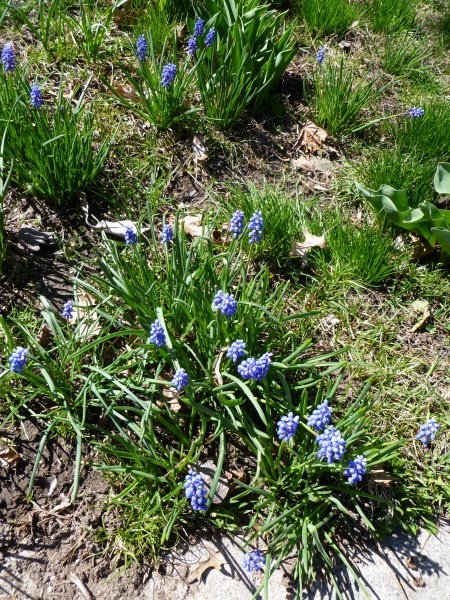 I do believe that’s grape hyacinth — a really interesting plant. I had to smile at your reference to pollen. We had a terrible spate of it about two weeks ago. Now, it’s not so bad, but when I was out and about yesterday, I discovered we’ve entered something far worse: mosquito season. Thank goodness I had the foresight to throw a can of repellent into the trunk of the car. If I hadn’t, my time outdoors in the slough would have been limited to getting out of the car, and getting back in! Our pollen has been awful — trees, mostly. Of course, there’s some sort of respiratory “crud” that’s making the rounds (they’re calling it a flu), and you can hardly venture out without hearing people coughing and sputtering. Thanks for reminding me about the mosquitoes. I understand bugs of ALL sorts are going to be prolific this year, thanks to our mild winter. ‘Tis pretty hard to come out ahead, isn’t it — a mild winter and a bug-less summer might just be asking too much! Happy Easter to you! Debbie, your photos are FANTABULOUS! Don’t ya just love Spring and all the beauty it brings? I can see from your photographs that you too have been blessed with colorful Spring! 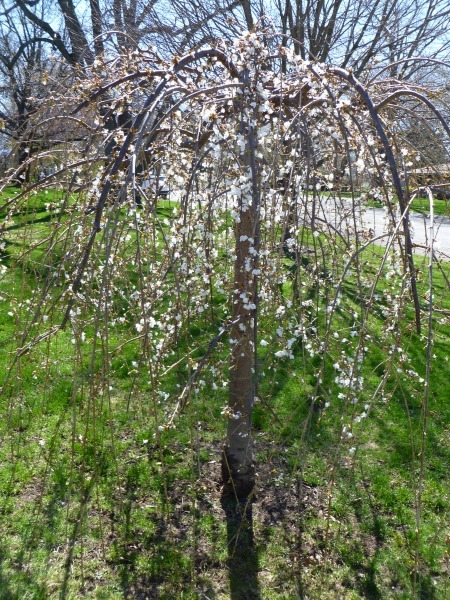 I love cherry blossom trees and was so delighted when I spotted several blossoming on my walk home from work last night. I especially like when the tiny petals fall on the city streets and sidewalks; looking like white and pink confetti! HAPPY EASTER, my friend! Have a wonderful day! Ron, I hope you don’t mind that I posted Spring photos on the heels of your delightful shots — what is it they say about imitation being the sincerest form of flattery?!? I was blessed to find such a pretty day for a walk. Dallas wasn’t one bit happy I left him at home, but sometimes it’s just too hard walking him and getting the right photos at the same time. I saw on the news last night that the cherry blossoms are blooming in Washington, D.C. — now, that’s a sight I’d like to see for myself. I suspect I’d be just one of millions with camera in hand! Happy Easter, Debbie! Gorgeous photos. I miss seeing daffodils. They were always the first sign of hope for me after a cold, dreary winter. Now I’m surrounded in cacti blooms! Have a great day! 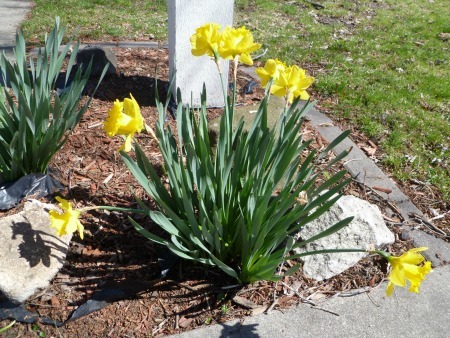 You know, DD, the thing about daffodils…some are in full bloom while others have yet to pop open. Must have something to do with their location. I need to dig mine up and replant them where they’ll get more sun — right now, they’re tucked in a shady spot that doesn’t take advantage of their beauty. I imagine a desert filled with blooming cacti is a sight to behold — every part of this great planet has its own particular loveliness. Happy Easter to you and yours! 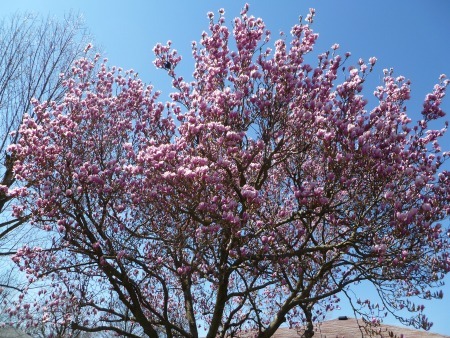 you have all of these gorgeous blooms already? WOW. That is resurrection! …..the good news is: The tomb is Empty. He is risen! Happy Easter, Debbie! Happy Easter to you — resurrection just might be the most wonderful hope of all, don’t you think?!? Happy Easter, Debbie. The photo’s are spectacular. 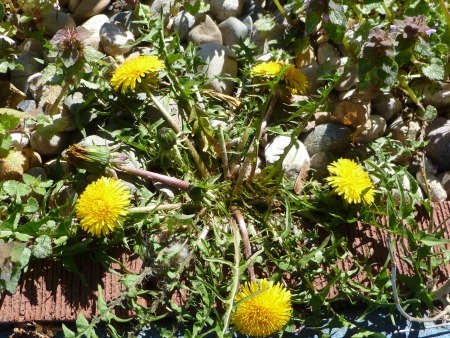 You have very healthy dandelions. Domer used to bring me dandelions (“Flowers, Mommy!”), so I had to include them. Yes, they do look healthy. I’ll have to remind the yard-man to do something about them before they take over. Happy Easter to you and yours! I used to love how the kids has the dandelion “sticky” stuff all over their hands after picking them. How well I remember that! And Domer’s little fingers used to stick to mine with all that “glue” on them. My favorite was when they turned into balls of fluff that you could blow apart! FF, hyacinths are among my favorites, too. Snapping that photo while their sweet scent was wafting around me was just plain heavenly. I could have sat right down in that patch of them and sniffed for much longer than it took to click the shot! Happy Easter Debbie! Those little purple flowers are grape hyacinths. 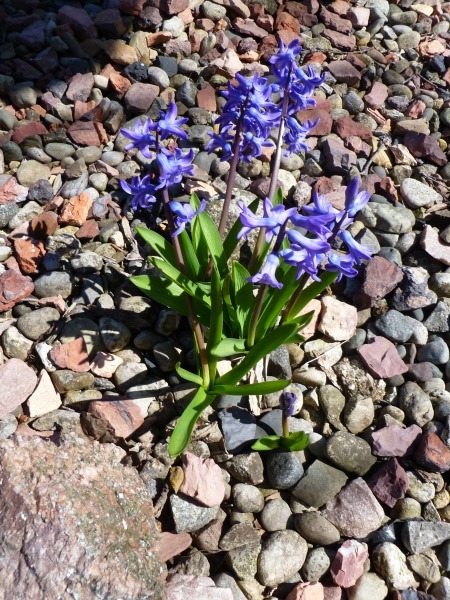 I had hundreds of them planted along my walkway in Oregon in the 90s so I know them well. Pretty little things – aren’t they? 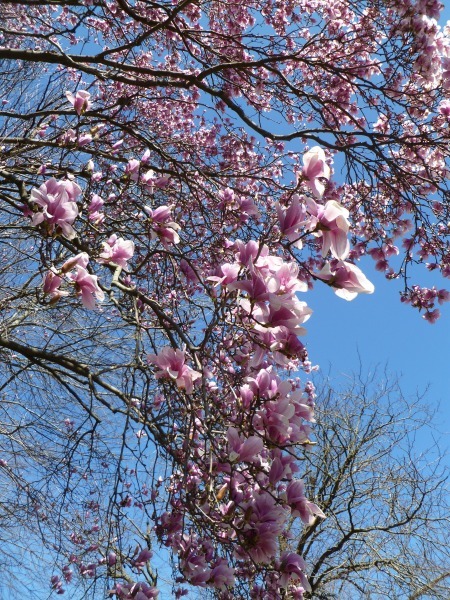 Thanks for courageously braving the pollen to share these beautiful spring captures. 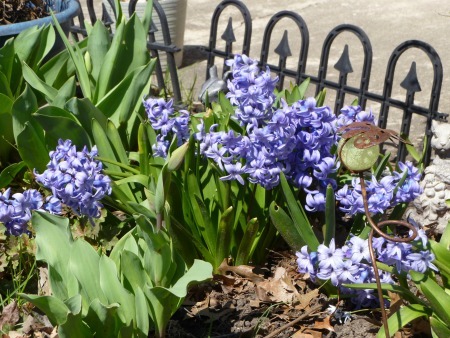 Those little grape hyacinths ARE beautiful, Barb. I’d seen them before, but I never knew what they were. Thanks for enlightening me! Our pollen has been in the “high” category for weeks now, thanks, I suppose, to our relatively mild winter. They tell us the bugs will be beastly this summer, too. Sigh. As long as the meds keep my sneezing under control, I’ll be out enjoying nature — who can resist, after winter’s gloom?!! Hoppy Easter! Spring is coming! Beautiful pictures. We aren’t seeing quite the display you are but it is fast approaching and my tulips should be in full bloom soon! How I love tulips, Katybeth! You must take a picture and show me, for I have only one pink tulip but I doubt it’s going to bloom. This morning, I saw the neighbor’s cat use it as a bathroom — grrr!! — so now I know who to blame! Hope you and Cole had a wonderful Easter! 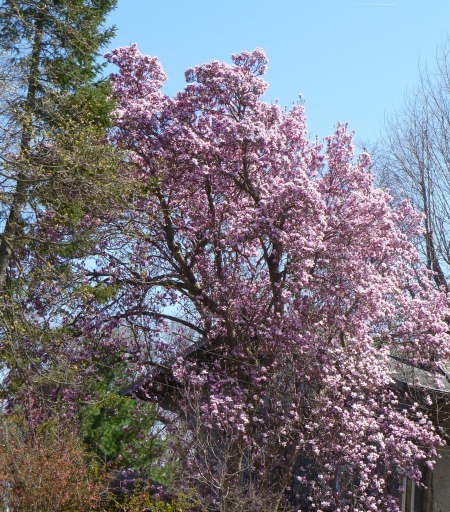 The pollen is awful, but aren’t the blooms gorgeous? Thanks, Suzi. Glad you enjoyed looking at them (without having to breathe the pollen, ha!) Happy Easter to you and yours! Mushrooms! The perfect thing to see about, I say. Pretty colors for sure! 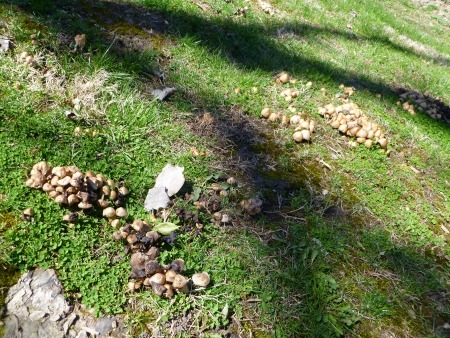 Professor, somehow I just knew you’d find this clump of mushrooms interesting. They look rather warrior-ish, don’t you think? Kind of like they’re plotting something!! Hope you and yours had a lovely Easter! I love that song, too, Monica! And its words are so true! Glad you enjoyed seeing all these pink trees — kind of looks like they got new dresses just in time for Easter and Spring! !